gDNA enrichment for NGS sequencing is an easy and powerful tool for the study of constitutional mutations. In this article, we present the procedure to analyse simply the complete sequence of 11 genes involved in DNA damage repair. Chevrier, S., Boidot, R. gDNA Enrichment by a Transposase-based Technology for NGS Analysis of the Whole Sequence of BRCA1, BRCA2, and 9 Genes Involved in DNA Damage Repair. J. Vis. Exp. (92), e51902, doi:10.3791/51902 (2014). The widespread use of Next Generation Sequencing has opened up new avenues for cancer research and diagnosis. NGS will bring huge amounts of new data on cancer, and especially cancer genetics. Current knowledge and future discoveries will make it necessary to study a huge number of genes that could be involved in a genetic predisposition to cancer. In this regard, we developed a Nextera design to study 11 complete genes involved in DNA damage repair. This protocol was developed to safely study 11 genes (ATM, BARD1, BRCA1, BRCA2, BRIP1, CHEK2, PALB2, RAD50, RAD51C, RAD80, and TP53) from promoter to 3'-UTR in 24 patients simultaneously. This protocol, based on transposase technology and gDNA enrichment, gives a great advantage in terms of time for the genetic diagnosis thanks to sample multiplexing. 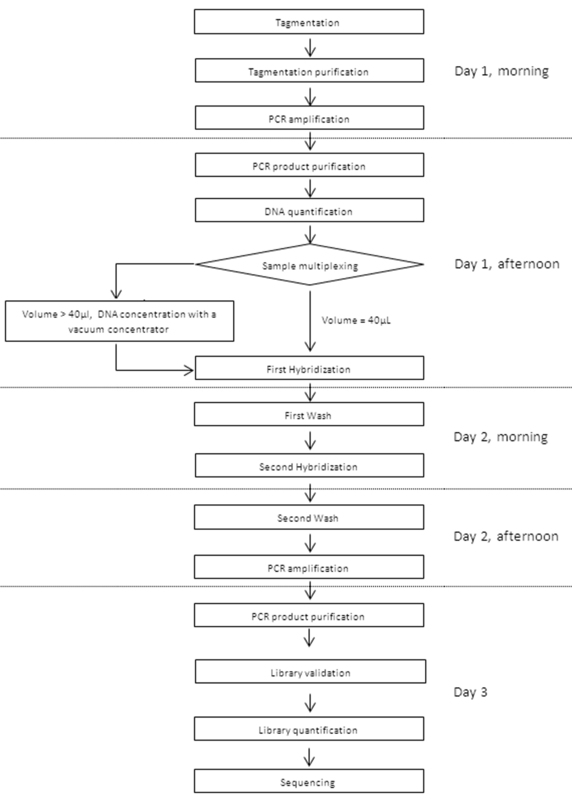 This protocol can be safely used with blood gDNA. In 2010, nearly 1.5 million people (essentially women) developed breast cancer worldwide. It is estimated that 5 to 10% of these cases were hereditary. Almost 20 years ago, BRCA1 and BRCA2 were identified as involved in hereditary breast and ovarian cancers1. Since about 15 years ago, BRCA1 and BRCA2 coding regions have been sequenced to determine the genetic predisposition to breast and ovary cancer. Alterations in BRCA1 and BRCA2 are detected in 10 to 20% of selected families2 suggesting that the analysis of these regions is not sufficient for effective screening. Recently, the analysis of non-coding sequences (promoter, introns, 3-’UTR) of BRCA1 and BRCA2 highlighted that new mutations/variations could be linked to a higher risk of breast cancer3-6. BRCA1 and BRCA2 proteins are involved in Homologous Recombination Repair (HHR), which is completed by numerous partners7. While alterations in BRCA1 or BRCA2 induce defects in DNA repair, the other partners may also affect the risk of breast cancer. This hypothesis appears to have been validated since BRIP18 and PALB29 have a proven impact on cervical and breast cancer, respectively. In addition, two other “moderate-risk” breast cancer susceptibility genes, ATM and CHEK2, may also be studied routinely10. Following on from these studies, we decided to develop a protocol to analyze 11 genes (ATM, BARD1, BRCA1, BRCA2, BRIP1, CHEK2, PALB2, RAD50, RAD51C, RAP80, and TP53) in 24 patients simultaneously using a very easy and relatively fast protocol based on transposase technology, with enrichment and sequencing on a medium throughput device. Thanks to this technique, we sequenced complete genes from the start of the promoter to the end of 3’-UTR, except for RAP80, for which an intronic region of 2,500 bp was not covered (Chr5: 176,381,588-176,390,180). This represents a total of about 1,000,300 bp studied with 2,734 probes. Usually, BRCA1 and BRCA2 exonic sequences are analyzed by Sanger sequencing, which needs 1.5 months for less than 20 patients. With the present protocol (Figure 1), in the same time, 11 complete genes for more than 75 patients could be analyzed. Quantify freshly extracted gDNA before preparation of the library. Use the fluorometric yield assessment method to quantify intact gDNA (avoid using a spectrophotometer for gDNA yield assessment). Measure the (260/280 nm) ratio and ensure that it is between 1.8 and 2. NOTE: 50 ng of gDNA are required for the experiment. From the DNA enrichment kit (see Table of Materials/Equipment), thaw DNA buffer (TD) and DNA enzyme (TDE1) solutions on ice. At least 30 min before use, bring purification magnetic beads and stop target (ST) buffer to room temperature (RT). Add 20 µl of gDNA sample at 2-2.5 ng/µl directly into a 96-well plate, 1 well per sample. IMPORTANT: Use a positive control to validate the protocol (sample with known sequence variation). Mix all reagents thoroughly by inverting 5x, and spin down briefly. At RT, add 25 µl of TD buffer to each well containing 50 ng (20 µl) of gDNA, and then 5 µl of TDE1 buffer. Set pipette to 50 μl, gently pipette the entire volume up and down 10x. 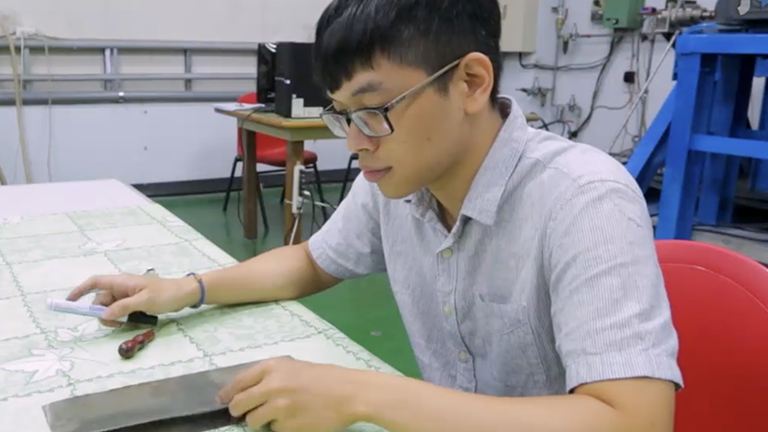 Cover the plate with an adhesive film and centrifuge for 1 min at 280 x g at 20 °C. Then, place the plate in a thermocycler (cover heated at 100 °C) and run the following program: 55 °C for 5 min and 10 °C for unlimited time. During this incubation, prepare the sample sheet with Experiment Manager software to define the indexes that will be used. NOTE: This step is critical. Be very careful. Check for the absence of precipitate in purification magnetic beads and ST buffer. If precipitates are present, warm up solutions in the hands. Thaw resuspension buffer (RSB) on ice. At RT, vortex ST solution and add 15 µl to each well containing sample. Set pipette to 65 μl, gently pipette the entire volume up and down 10x. Incubate for 5 min at RT. Cover the plate and centrifuge for 1 min at 280 x g at 20 °C. Add 52 µl of previously mixed purification magnetic beads in each well. Set pipette to 117 μl, gently pipette the entire volume up and down 10x. Incubate for 10 min at RT. Cover the plate and centrifuge for 1 min at 280 x g at 20 °C. Remove the adhesive film. Place the 96-well plate on a magnetic stand for 2 min at RT. Ensure that the supernatant appears completely clear. Prepare a fresh 80% ethanol solution (for 24 samples, add 2 ml of distilled water to 8 ml ethanol). Remove and discard the supernatant taking care not to disturb the beads. While keeping the plate on the magnetic stand, add 200 µl of freshly prepared 80% ethanol to each well without disturbing the beads and incubate the plate for at least 30 sec at room temperature. Discard the supernatant and repeat this wash a second time. Ensure the ethanol has been removed. Let dry at room temperature for 10 min or until complete evaporation of ethanol. Remove the plate from the magnetic stand and add 22.5 µl of RSB buffer. Set the pipette to 22.5 μl, gently pipette the entire volume up and down 10x. Place the 96-well plate on the magnetic stand and incubate for 2 min. Ensure that the supernatant appears completely clear. Gently transfer 20 µl of the supernatant in a new 96-well plate. NOTE: Optionally, determine the size of the tagmented samples by using a fragment analyzer. Instead of the steps mentioned above, use high-resolution acrylamide gel electrophoresis. Fragments should be between 150 bp and 1,000 bp. Thaw PCR master mix containing polymerase (LP-PMM), Index 1 primer, and Index 2 primer solutions on ice. Match the combination of indexes with the Experiment Manager sample sheet. For multiplexing, prepare different i7 from index 1 (i7, N7xx) for each sample. In each well, add 20 µl of LP-PMM, 5 µl of Index 1, and 5 µl of Index 2. Set the pipette to 50 μl, gently pipette the entire volume up and down 10x. Cover the plate with an adhesive microseal film. Centrifuge for 1 min at 280 x g at 20 °C. Place the plate in a thermocycler (cover heated at 100 °C) and run program 1 (Table 1). NOTE: the procedure may be stopped at this point and the reactions stored overnight in the thermocycler or for 2 days between 2 and 8 °C. Thaw oligos (CSO), capture target buffer 1 (NCT1), and RSB solutions on ice. At least 30 min before use, bring purification magnetic beads to RT. Centrifuge the plate from step 2.4, for 1 min at 280 x g at 20 °C. At RT, add 45 µl of mixed purification magnetic beads in each well. Set the pipette to 95 μl, gently pipette the entire volume up and down 10x. Incubate for 10 min at RT. Place the 96-well plate on a magnetic stand for 2 minutes at RT. Ensure that the supernatant appears completely clear. Prepare a fresh 80% ethanol solution (for 24 samples, add 2 ml of distilled water to 8 ml ethanol). Discard the supernatant taking care not to disturb the pellet. While keeping the plate on the magnetic stand, add 200 µl of freshly prepared 80% ethanol to each well without disturbing the beads and incubate the plate for 30 sec at room temperature. Discard the supernatant and repeat this wash a second time. Ensure the ethanol has been removed. Let dry at room temperature for 15 min. Remove the plate from the magnetic stand and add 40 µl of RSB buffer. Set the pipette to 40 μl, gently pipette the entire volume up and down 10x. Place the 96-well plate on the magnetic stand and incubate for 2 min. The supernatant should appear completely clear. Gently transfer 38 µl of the supernatant into a new 96-well plate. Determine the yield of each sample by a fluorimetric method. 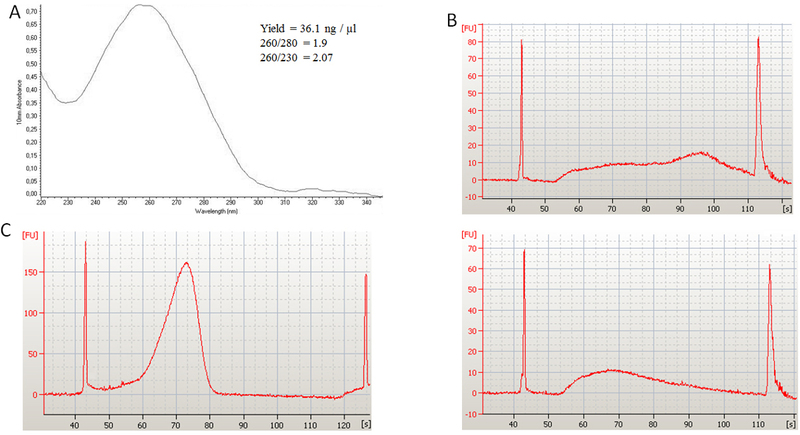 This first part of the protocol will be validated if the assessed yields are between 30 and 50 ng/µl. Pool up to 12 samples per pool at this stage by mixing 500 ng of each sample in a new 96-well plate. Ensure that the final volume of each pool does not exceed 40 µl. NOTE: If needed, decrease the volume of pools by using a vacuum concentrator device at RT (Caution: the concentration of DNA cannot be modified by heating, even at 30 °C as heating causes DNA degradation). Adjust the final volume to 40 µl by adding RSB solution. Thoroughly mix the NCT1 solution. For each well containing 40 µl of pooled DNA samples, add 50 µl of NCT1, and 10 µl of CSO. Set the pipette to 100 μl, gently pipette the entire volume up and down 10x. Seal the plate and centrifuge for 1 min at 280 x g at 20 °C. Place the plate in a thermocycler (cover heated at 100 °C) and run program 2 (Table 1). From the DNA enrichment kit (see Table of Materials/Equipment) thaw 2 N NaOH (HP3), target elution buffer 1 (ET1), target elution buffer 1 ET2, streptavidin magnetic beads (SMB), wash solution 1 (WS1), wash solution 2 (WS2), wash solution 3 (WS3), CSO, and NCT1 solutions at RT. Remove the 96-well plate from the thermocycler and centrifuge 1 min at 280 x g at 20 °C. Remove the adhesive cover very carefully. Transfer the 100 µl reaction mix from the plate to a new MIDI 96-well plate and add 250 µl of well vortexed SMB solution. Set the pipette to 350 μl, gently pipette the entire volume up and down 10x. Seal the plate and incubate at RT for 30 min. Centrifuge for 1 min at 280 x g at 20 °C, remove the adhesive seal and place the plate on the magnetic stand for 2 min. Ensure that the supernatant appears completely clear. Discard the supernatant and remove the plate from the magnetic stand. Add 200 µl of well mixed WS1 solution into the well containing beads. Set the pipette to 200 µl and gently pipette the entire volume up and down 15x avoiding the formation of bubbles/foam. Place the plate on the magnetic stand for 2 min. Ensure that the supernatant appears completely clear. Discard the supernatant and remove the plate from the magnetic stand. Add 200 µl of well mixed WS2 solution into wells containing beads. Set the pipette to 200 µl and gently pipette the entire volume up and down 15x avoiding formation of bubbles/foam. Add 200 µl of well mixed WS2 solution into wells containing beads. Set the pipette to 200 µl and gently pipette the entire volume up and down 15x. Transfer the entire volume in a new 96-well plate. Seal the plate and place the plate in a thermocycler (cover heated at 100 °C). Launch the thermocycler at 42 °C for 30 min. Imediately place the plate on the magnetic stand for 2 min. Ensure that the supernatant appears completely clear. Remove the seal and immediately discard all the supernatant. Then, remove the plate from the magnetic stand. Add 200 µl of WS2 into wells containing beads. Set the pipette to 200 µl and gently pipette the entire volume up and down 15x avoiding formation of bubbles/foam. Seal the plate and place the plate in a thermocycler (cover heated at 100 °C). Launch the thermocycler at 42 °C for 30 min. Immediately place the plate on the magnetic stand for 2 min. Ensure that the supernatant appears completely clear. Remove the seal and immediately discard all the supernatant. Then, remove the plate from the magnetic stand. Add 200 µl of well mixed WS3 solution into wells containing beads. Set the pipette to 200 µl and gently pipette the entire volume up and down 15x. Place the plate on the magnetic stand for 2 min. Ensure that the supernatant appears completely clear. Discard all the supernatant and remove the plate from the magnetic stand. Repeat the WS3 wash a second time. After removing supernatant, seal the plate and briefly centrifuge to pull down residual supernatant. Place the plate on the magnetic stand for 2 min. Discard the residual supernatant. In a 0.2 ml tube, mix 28.5 µl of ET1 and 1.5 µl of HP3 solutions. This mix is for 1 pool, if more pools are prepared, multiply these volumes by the number of pools prepared. Remove the plate from the magnetic stand. Add 23 µl of the above-prepared mix. Set the pipette to 23 µl and gently pipette the entire volume up and down 15x. Seal the plate and leave for 5 min at RT. Centrifuge for 1 min at 280 x g at 20 °C. Place the plate on the magnetic stand for 2 min. Ensure that the supernatant appears completely clear. Remove the adhesive film and transfer 21 µl of supernatant to a new 96-well plate. Add 4 µl of ET2 solution to each well. Set the pipette to 25 µl and gently pipette the entire volume up and down 10x and seal the plate. NOTE: the procedure may be stopped at this point and the reactions stored for up to 7 days at -15 °C. If the plate is frozen, completely thaw before starting the 2nd hybridization. Centrifuge the plate for 1 min at 280 x g at 20 °C. Remove the adhesive film and add 50 µl of NCT1, 10 µl of CSO, and 15 µl of PCR grade water to the 25 µl of library. Set the pipette to 100 µl and gently pipette the entire volume up and down 10x. Seal the plate and centrifuge for 1 min at 280 x g at 20 °C. Thaw ET1, ET2, SMB, WS1, WS2, WS3 and HP3 solutions at RT for hybridization wash. From the DNA enrichment kit, thaw PCR master mix containing polymerase (TC-PMM), PCR primer cocktail (PPC), and RSB solutions on ice for PCR amplification. Follow exactly the same protocol as for 4.2 – 1st hybridization wash. In a new 96-well plate, mix 20 µl of elution from step 5.2, 25 µl of TC-PMM, and 5 µl of PPC. Set the pipette to 50 µl and gently pipette the entire volume up and down 10x. Seal the plate and centrifuge for 1 min at 280 x g at 20 °C. Place the plate in a thermocycler (cover heated at 100 °C) and run program 3 (Table 1). Thaw RSB solution on ice. At least 30 min before use, bring purification magnetic beads to RT. Centrifuge the plate from step 5.3 for 1 min at 280 x g at 20 °C, and remove the adhesive cover. At RT, add 90 µl of previously mixed purification magnetic beads in each well. Set the pipette to 140 μl, gently pipette the entire volume up and down 10x. Incubate for 15 min at RT. Place the 96-well plate on a magnetic stand for 5 min at RT. Ensure that the supernatant appears completely clear. Prepare a fresh 80% ethanol solution (for 2 samples, add 200 µl of distilled water to 800 µl ethanol). Discard the supernatant taking care not to disturb the pellet. While keeping the plate on the magnetic stand, add 200 µl of freshly prepared 80% ethanol to each well without disturbing the beads and incubate the plate for 30 sec at RT. Discard the supernatant and repeat this wash one more time. Ensure the ethanol has been removed. Let dry at RT for 15 min or until complete evaporation of ethanol while the plate is on the magnetic stand. Remove the plate from the magnetic stand and add 30 µl of RSB buffer. Set the pipette to 30 μl, and gently pipette the entire volume up and down 10x. Incubate the plate for 2 min at RT. Place the 96-well plate on the magnetic stand and incubate for 5 min or until the supernatant appears completely clear. Gently transfer 28 µl of the supernatant into a new 96-well plate (plate type: TCY). NOTE: The procedure may be stopped at this stage and the reactions stored at -15 °C for up to 7 days. Determine the quality of the library by using a fragment analyzer. High resolution acrylamide gel electrophoresis might be used to replace the steps mentioned above but is not recommended. Fragments should be between 150 bp and 1,000 bp. NOTE: Recommended: Quantify the library by qPCR to obtain the best number of clusters during sequencing. As a reference, use a validated library (2 nM). If the first library is being prepared, use the phage PhiX DNA (10 nM) provided for calibration of the sequencing device. Prepare serial dilutions of positive control to obtain 7 points at 20, 16, 8, 6, 4, 2, and 1 pM in EBT (EB elution buffer + 0.1% Tween 20). Dilute the library of interest at 1/1,000 and 1/2,000. Each point must be analyzed in triplicate. 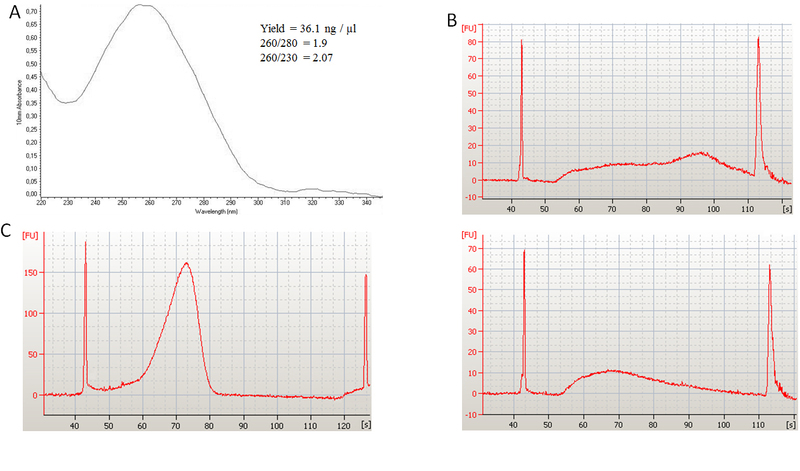 Prepare the following mix (multiply volumes by the number of wells used): for 1 well, add 10 µl of sybr green containing qPCR master mix (2x), 0.2 µl of forward primer (10 µM, AATGATACGGCGACCACCGAGAT), 0.2 µl of reverse primer (10 µM, CAAGCAGAAGACGGCATACGA), and 7.6 µl PCR grade water. After mixing, depose in a 96-well plate, 18 µl of mix into each well and 2 µl of positive control and library dilutions. Seal the plate and centrifuge for 1 min at 280 x g at 20 °C. Then, place the plate in a quantitative PCR thermocycler and run program 4 (Table 1). Analyze the results as conventional absolute quantification to obtain the yield of each library. The advantage of qPCR is that it only quantifies DNA that will interact with the flow cell. NOTE: Do not use fluorimetric quantification of DNA due to the presence of DNA mimetic molecules in one of the reagents. This quantification method would overestimate the library yield and consequently underestimate the clustering score. Dilute each library at 4 nM in a final volume of 30 µl of elution buffer (EB), and pool all libraries and mix well. Prepare a fresh 0.2 N NaOH solution in EB buffer and mix 10 µl of this NaOH solution with 10 µl of pooled libraries. Mix well and incubate exactly 5 min at RT. After the 5 min, immediately add 980 µl of Hybridization buffer (from sequencing cartridge) and mix well. Then, mix 400 µl of this mixture with 600 µl of Hybridization buffer. Mix well and transfer 600 µl into a 300 cycle cartridge (2 x 150) for an injection of 8 pM. Launch sequencing. Once the device has processed the data, transfer the .bam and .vcf files to a new computer. NOTE: Transposase fragmentation incorporates footprints. Consequently, the software automatically trims these data. Collect genetic variations obtained with the device analysis. Analyze exported files (.bam, .vcf) with another software (Alamut) by following the manufacturer’s instructions. Then, compare the genetic variations obtained with both analyses. Only variations detected twice are considered present. The ability of this method to determine sequences of target genes is based on the quality of the gDNA (Figure 2A) and the quality of the tagmentation step. If the tagmentation is not sufficient (Figure 2B, upper panel), the sequencing will not be satisfactory. As mentioned above, after the tagmentation purification, the gDNA should be tagmented into fragments from 150 bp to 1,000 bp with the majority of fragments around 300 bp (Figure 2B, lower panel). At the end of library preparation, library quality is checked by using a Bioanalyser. The profile obtained should be approximately the same as after tagmentation but with a higher numbers of fragments (Figure 2C). If library quality is not identical to Figure 1C, sequencing should not be performed. Once the sequencing is launched on the sequencing device, the clustering score is available after 9 cycles and should be between 800,000 and 1,100,000 clusters / mm² (Figure 3A). If this number is lower, the sequencing will not be satisfactory, especially in depth of read. If it is higher, the images will be blurred (Figure 3B), and no analysis will be done due to the impossibility to differentiate clusters. At the end of the run, it is important to check the Quality score. By following the protocol detailed above, the quality score of the run will correspond to Figure 4. The quality of sequencing is represented by a Q-score (Q-30). To validate the experiment, at least around 75% of sequences (clusters) should have a Q-score superior or equal to 30. This experiment was designed to study constitutional genetic abnormalities. In this case, the genetic abnormality is present at 50% in the genome. Because of this, the sequencing depth is not very important. Herein, we prepared and sequenced simultaneously 2 libraries of 12 patients for 11 complete genes. To obtain high sequencing depth, the number of multiplexed patients has to be decreased. As gDNA enrichment is based on capture by probes, the enrichment is not homogeneous (Figure 5). With our protocol, we generated about 6 Gb of reads, inducing a mean coverage of 150 reads for each base, with a minimum of 20 and a maximum of 330 reads. These read depths are in accordance with the use of NGS in clinical practice11. 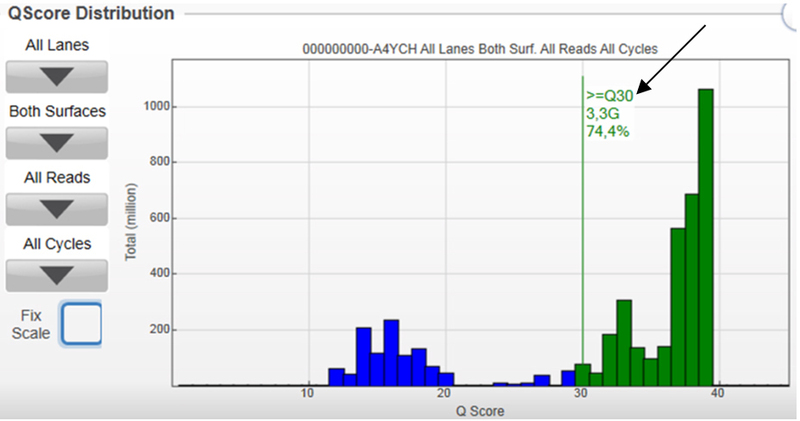 Despite the heterogeneity of read depths, probably due to gDNA enrichment by capture, and not the major rearrangement of genes, it is important to note that the Q-score was always superior to 30 (Figure 5), thus validating the sequencing. Nevertheless, it is important to validate the technology by comparing the results obtained with those obtained with Sanger sequencing. In the 17 patients sequenced by both Sanger sequencing (coding sequences of BRCA1 and BRCA2) and transposase based technology, we detected the same 330 genetic variations (SNP and mutations). 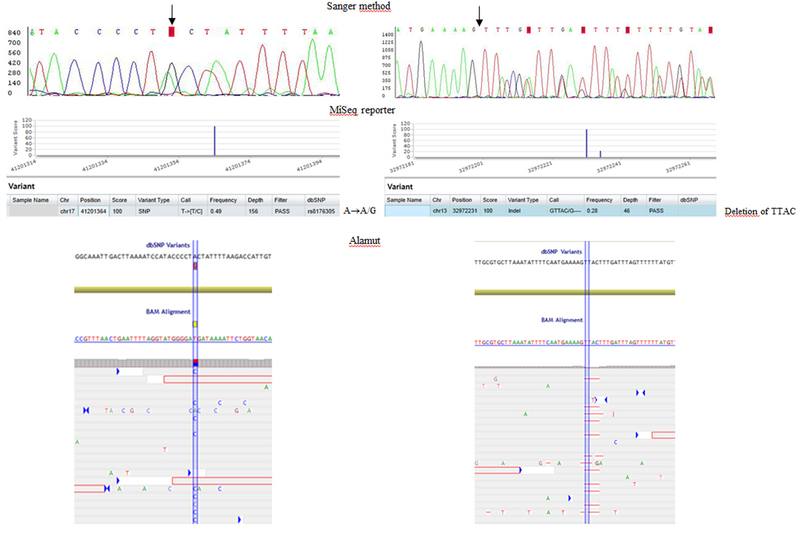 As an example, a point mutation in the BRCA1 gene (Figure 6 left) and a deletion of 4 bases in the BRCA2 gene (Figure 6 right) were detected by both Sanger and transposase-based methods. As BRCA1 is on the reverse strand of Chromosome 13, it is important to note that it is necessary to complement (but not invert) the sequence obtained, whereas for BRCA2 (on the forward strand), the obtained sequence does not need to be complemented. As indicated in Figure 5, NGS technology gives an estimated frequency of the genetic variation, whereas the Sanger method does not. Moreover, especially for indel variations, the interpretation is easier with NGS technology. As shown in Figure 6 right, indel variation sequences appear as a scrambled electropherogram that needs forward and reverse sequencing to decipher the inserted or deleted sequence. With NGS analysis, the inserted or deleted sequence is directly determined, thus reducing the risk of misinterpretation. Finally, transposase based technology allowed us to analyze a greater number of target genes, and we found many new genetic variation sequences that were not covered by Sanger sequencing. These results will be published elsewhere. Figure 1. Schematic workflow of the procedure. Please click here to view a larger version of this figure. Figure 2. Quality controls before and after library preparation. A. Spectrophotometric profile of gDNA that can be safely used for tagmentation. The DNA yield must be higher than 5 ng/µl, 260/280 and 260/230 ratios must be superior to 1.8 and 2, respectively. B. Fragment analyzer profiles of tagmented gDNA. Upper panel represents insufficiently tagmented gDNA. Lower panel shows a perfectly tagmented sample. C. Fragment analyzer profile of prepared library just before sequencing launching. Fragment size is the same as tagmented gDNA (B, lower panel) but with an amplified amount. Please click here to view a larger version of this figure. Figure 3. Checking cluster generation. 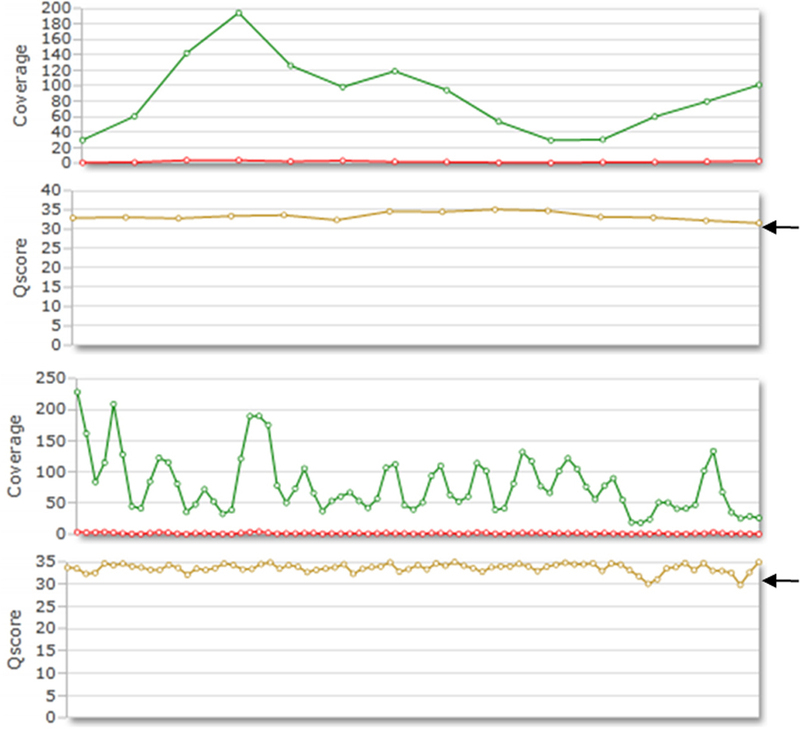 A. Screenshot of the sequencing device during the run. Cluster density should be between 800 and 1,000 K/mm². B. Different images correspond to low density (upper panel), high density (lower panel) and perfect density (middle panel). Please click here to view a larger version of this figure. Figure 4. Checking the Q-score. At the end of the run, validated sequencing should have at least 75% of generated clusters with a Q-score superior to 30. Please click here to view a larger version of this figure. Figure 5. Representing coverage data and their corresponding Q-score. The read depth is heterogeneous all along the covered gene. Nevertheless, the Q-score of covered regions is always superior to Q-30. Please click here to view a larger version of this figure. Figure 6. Representative results obtained with Sanger sequencing and with transposase-based technology. All genetic variations observed with Sanger sequencing were detected with the transposase-based technology. Whereas point mutations are easy to interpret, indel alterations are sometimes quite difficult to study with the Sanger method. With transposase-based technology associated with a medium throughput device, indel alterations are simple to discover. Nevertheless, it is important to note that it is necessary to complement (but not invert) sequences obtained when the target gene is located on the minus strand (here the BRCA1 gene). Please click here to view a larger version of this figure. The widespread use of NGS devices and technologies has provided new opportunities in the study of cancer and genetic disorders. In addition to whole genome sequencing or RNA sequencing, the analysis of a large amount of selected gDNA sequences in numerous patients simultaneously offers great prospects in diagnosis. Here, we developed a specific design (available on demand) using Nextera technology to study 11 complete genes in 24 patients simultaneously with a medium throughput sequencing device (Table of Materials/Equipment). This protocol allows quick generation of data that enables a rapid response to patients’ concerns with a low risk of error. 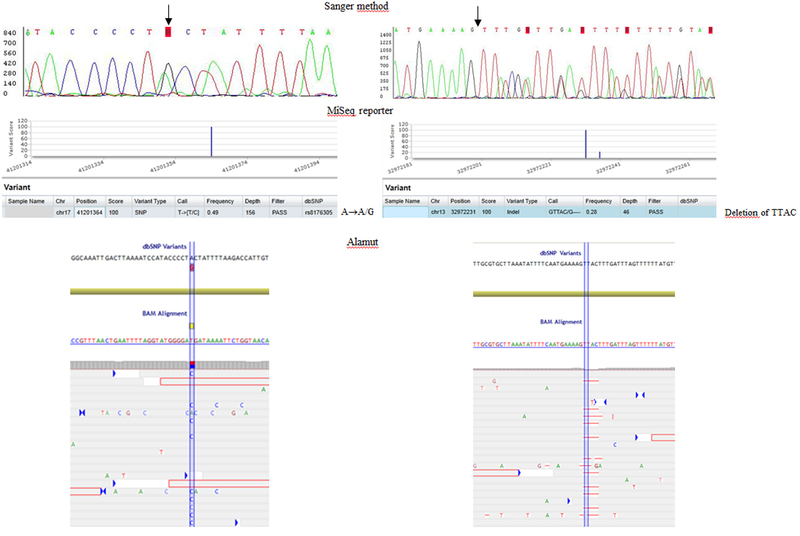 As illustrated in Figure 6, all genetic variations detected with Sanger sequencing were also detected by using the transposase-based preparation kit. This method is reliable and easy to interpret, especially for complex indel alterations that are analyzed directly. Nevertheless, it is important to note that for genes located in the minus strand, it is necessary to complement (without reversing) nucleotides. The present work was carried out with a design for the analysis of 11 complete genes, but the protocol is the same whatever the design chosen. Transposase-based technology can also be used for library preparation from long-range PCR products12. Indeed, the algorithm (developed by the manufacturer) used for the design (manufacturer website tool, see Table of Materials/Equipment) is specifically dedicated for this protocol. In addition to transposase-based technology, two other mechanisms of DNA fragmentation before library preparation are also available: mechanical fragmentation and enzymatic fragmentation. Mechanical DNA fragmentation is reproducible but needs an ultrasonicator, and library preparation is more expensive and more time consuming. Enzymatic DNA fragmentation often induces problems for DNA capture due to restriction enzyme site locations, resulting in a lack of target sequence coverage. Nevertheless, each strategy for DNA fragmentation has advantages and disadvantages but seems to give quite similar results, at least for long range PCR product fragmentation13. The use of a new enzyme cocktail seemed to provide the same results as those obtained with mechanical DNA fragmentation14. Transposase-based technology needs high quality DNA (not applicable for DNA extracted from FFPE tissues). Moreover, the activity of transposase needs fragments of more than 300 bp, suggesting that fragments of interest must be longer than this length. This specificity explains the need for high-quality, un-fragmented DNA. Up to now, genetic variations of BRCA1 and BRCA2 have been studied in familial breast and ovarian cancers. However, the involvement of BRCA genes, and especially BRCA2, is now suspected in other cancers, particularly in pancreas15, prostate16, and testis cancers17. The genetic alteration of PALB2, a partner of BRCA genes, is also associated with pancreatic cancer18. Moreover, it recently appeared that patients harboring BRCA mutations, and to a lesser extent PALB2 mutations, showed a better response of their pancreatic cancer to PARP inhibitors19. As BRCA1, BRCA2, and PALB2 are associated with a familial risk of cancer, and possibly associated with susceptibility to specific treatments, it appears important to explore the BRCA1 and BRCA2 partners in screening for familial cancer risk and in screening for cancer treatment response. From these data, the analysis of DNA break repair-related genes seems to be important not only for the screening of susceptibility but also for a putative indicator of treatment response. Moreover, the complete gene analysis proposed with this protocol could cover all alterations that could be congenitally present (and present in cancer cells), such as mutations in the promoter, splicing sites or regulatory splicing sites located in introns. To date, alterations in non-coding sequences of genes have not been studied in depth, but the development of genome-wide association studies could highlight important functions of these sequences. In conclusion, the transposase-based design developed in this paper is an interesting way to explore genetic abnormalities in cancer susceptibility genes involved in DNA damage repair. The possibility to sequence 11 complete genes for 24 patients simultaneously is an important advantage compared with the Sanger sequencing method, which is quite a difficult technique for screening. We thank the Ligue contre le Cancer de Côte d’Or and the Centre Georges-François Leclerc for their financial support. We thank Philip Bastable for the editing of the manuscript. Cornelisse, C. J., Cornelis, R. S., Devilee, P. Genes responsible for familial breast cancer. Pathol. Res. Pract. 192, (7), 684-693 (1996). Culver, J., Lowstuter, K., Bowling, L. Assessing breast cancer risk and BRCA1/2 carrier probability. Breast Dis. 27, 5-20 (2007). Cox, D. G., et al. Common variants of the BRCA1 wild-type allele modify the risk of breast cancer in BRCA1 mutation carriers. Hum. Mol. Genet. 20, (23), 4732-4747 (2011). Maia, A. T., et al. Effects of BRCA2 cis-regulation in normal breast and cancer risk amongst BRCA2 mutation carriers. Breast Cancer Res. 14, (2), 63 (2012). Anczuków, O., et al. BRCA2 deep intronic mutation causing activation of a cryptic exon: opening toward a new preventive therapeutic strategy. Clin. Cancer Res. 18, (18), 4903-4909 (2012). Brewster, B. L., et al. Identification of fifteen novel germline variants in the BRCA1 3'UTR reveals a variant in a breast cancer case that introduces a functional miR-103 target site. Hum. Mutat. 33, (12), 1665-1675 (2012). Roy, R., Chun, J., Powell, S. N. BRCA1 and BRCA2: different roles in a common pathway of genome protection. Nat Rev Cancer. 12, (1), 68-78 (2012). Ma, X. D., et al. First evidence for the contribution of the genetic variations of BRCA1-interacting protein 1 (BRIP1) to the genetic susceptibility of cervical cancer. Gene. 524, (2), 208-213 (2013). Haanpää, M., Pylkäs, K., Moilanen, J. S., Winqvist, R. Evaluation of the need for routine clinical testing of PALB2 c.1592delT mutation in BRCA negative Northern Finnish breast cancer families. BMC Med. Genet. 14, 82 (2013). Southey, M. C., Teo, Z. L., Winship, I. PALB2 and breast cancer: ready for clinical translation. Appl. Clin. Genet. 6, 43-52 (2013). Ulahannan, D., Kovac, M. B., Mulholland, P. J., Cazier, J. B., Tomlinson, I. Technical and implementation issues in using next-generation sequencing of cancers in clinical practice. Br. J. Cancer. 109, 827-835 (2013). Hernan, I., Borràs, E., de Sousa Dias, M., Gamundi, M. J., Mañé, B., Llort, G., Agúndez, J. A., Blanca, M., Carballo, M. Detection of genomic variations in BRCA1 and BRCA2 genes by long-range PCR and next-generation sequencing. J. Mol. Diagn. 14, 286-293 (2012). Knierim, E., Lucke, B., Schwarz, J. M., Schuelke, M., Seelow, D. Systematic comparison of three methods for fragmentation of long-range PCR products for next generation sequencing. Plos One. 6, e28240 (2011). de Sousa Dias, M., Hernan, I., Pascual, B., Borràs, E., Mañé, B., Gamundi, M. J., Carballo, M. Detection of novel mutations that cause autosomal dominant retinitis pigmentosa in candidate genes by long-range PCR amplification and next-generation sequencing. Mol. Vis. 19, 654-664 (2013). The Breast Cancer Linkage Consortium. Cancer Risks in BRCA2 Mutation Carriers. J. Natl. Cancer Inst. 91, 1310-1316 (1999). Levy-Lahad, E., Friedman, E. Cancer risks among BRCA1 and BRCA2 mutation carriers. Br. J. Cancer. 96, (1), 11-15 (2007). Risch, H. A., et al. Population BRCA1 and BRCA2 mutation frequencies and cancer penetrances: a kin-cohort study in Ontario, Canada. J. Natl. Cancer Inst. 98, (23), 1694-1706 (2006). Slater, E. P., et al. PALB2 mutations in European familial pancreatic cancer families. Clin. Genet. 78, 490-494 (2010). Brennan, G. T., Relias, V., Saif, M. W. BRCA and pancreatic cancer. J.O.P. 14, (4), 325-328 (2013).